While plenty of programs for first-year students — summer bridge, first-year orientation, first-year student success courses, advising and counseling, learning communities — have found success in four-year colleges and universities, a new study examined the issues two-year schools face in getting students engaged in the campus, staying in school and accumulating credits. First-year college readiness survey (14 percent). Schools with formal "first-year experience" (FYE) programs (making up 40 percent of respondents) tended to deliver more first-year activities (1.5 more, on average), noted author Rayane Alamuddin, an associate director for research and evaluation at Ithaka. They also differed from the others by the type of activities they offered, with an emphasis on those "backed by experimental evidence" of boosting student outcomes. "They are significantly more likely to offer first-year mentor programs, summer bridge programs, first-year advising, social events or networking, customized degree plans or guided pathways, and cohort classes or learning communities," the report stated. They're also more likely to require first-years to interact with career services and to offer first-year seminars focusing on professional or career-based content. The report revealed that two-year schools faced a number of challenges in their first-year programming. The most common problem: a lack of financial resources, mentioned by 74 percent of respondents. Resistance to change among faculty and staff surfaced in 38 percent of institutions. Those respondents with FYE programs were more likely to mention hurdles related to infrastructure challenges and institutional politics. "This suggests," wrote Alamuddin, "that developing and running FYE programs may highlight challenges surrounding particular institutional structures and resources, or may potentially strain existing structures and resources at institutions that serve two-year students." What the researcher found particularly troubling was how few two-year institutions "tailor their first-year programming to the two-year context." For example, the activities supported with experimental evidence "are uncommon." And transfer- and career-related elements don't get the kind of attention they warrant. 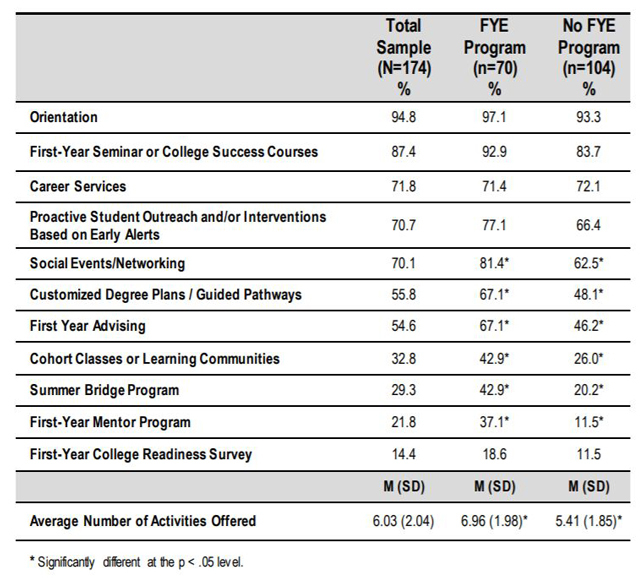 Based on interviews with some of the respondents as well as survey findings, the report suggested that colleges consider using dedicated programs or departments to coordinate first-year practices and that they conduct more internal research and data analysis "to inform their programming decisions." TYFY is a nonprofit created by a group of two-year college professionals to share best practices among programs supporting first-year students; Ithaka is a nonprofit that consults to higher education. Their report was based on a 2017 survey of 525 two- and four-year institutions and a 2012 national survey of student success practices at 286 nonprofit two-year institutions. The full report is openly available on the Ithaka website.